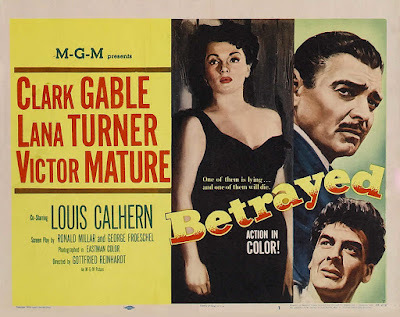 1954’s “Betrayed” involves the Dutch Resistance’s fight against the Third Reich, though its top-tier spy, Colonel Pieter Deventer (Clark Gable), sounds less Dutch than gruffly Ohioan, though perhaps that is merely part of his ruse, so good is he, it seems, in the espionage arts. That is why, after finally, improbably being caught, Third Reich Colonel Dietrich (O.E. Hasse) does not torture nor even really interrogate Deventer; no, he tries to recruit Deventer. He wants the Dutchman to become a double agent, which seems absurd, but Dietrich does not really pitch this possible ruse as Deventer aiding the Nazis so much as an opportunity for Deventer to perform the ultimate espionage role. In the spy game, playing a Double Agent is like playing Hamlet! Who wouldn’t want to tackle that at least once?! Deventer never takes his captor up on this offer – well, we don’t think – because he is broken out of where he is being held by a flamboyant freedom fighter known only as The Scarf (Victor Mature) on account of the voguish neckwear he sports while resisting. Still, that Dietrich appeals to Deventer in this manner is crucial, revealing “Betrayed” as a movie less about the tenets and inner-workings of the resistance than undercover activities as something like entertainment. If it takes three to tango, that’s essentially what this trio does, metaphorically circling one another with everybody’s motivations in question, though Deventer’s are less so since, after all, he is played by Clark Gable and Clark Gable cannot be the bad guy. If the end becomes not only inevitable but obvious, that did not have to be a problem or even if necessary, except that “Betrayed” is overlong, not so much ratcheting up tension as shifting into dramatic down gear, becoming increasingly talky as it goes long, leaving one character to sort of stand and explain the other character to his or herself. 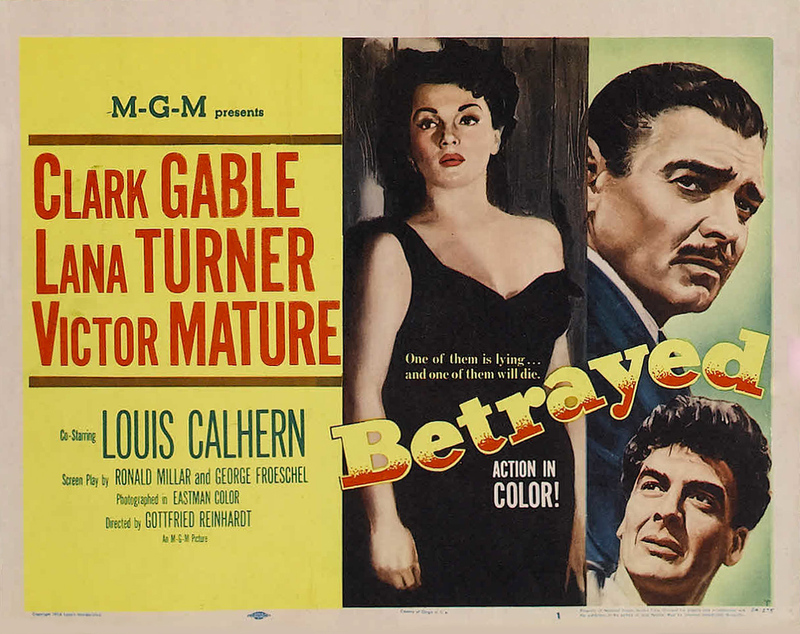 “Betrayed” was shot on location in Amsterdam and Amherst, and while that might have suggested a film in the neorealist vein, cinematographer Freddie Young goes the other direction, implementing a rich color scheme to give frame after frame the air of a painting. This is not to suggest that the visuals rob the film of any of its emotional urgency. If anything, as the film progresses and gets more talky and slows down, the more the visuals rescue it, transforming sequences that otherwise should have been sucked dry into grand statements of passion. Never is this any more apparent than the concluding twist. By the time The Scarf offically turns coat, you merely shrug your shoulders, and yet the way in which this turn happens, leading to him being shot by Deventer and dying is artistically elevated to a level the story itself can never hope to reach. As The Scarf lays in the open road, the way in which Young sort of drains the color from the surrounding countryside makes the dead body laying there stand out. And like a painting pushes out everything else so that you only see it, so does this shot, momentarily wiping away all the talky exertions and reversals, leaving only death, and a movie you were ready to have end suddenly lingers a long time after its ending. I haven't seen this picture. Gable and Turner intrigue me though.